Last month Eight Ghosts, a book of ghost stories based on famous English Heritage sites, went on sale – much to the delight of the general public. Here, Shaun Soanes, who has worked on a number of historical buildings boasting tales of the unexpected, explains why mysterious occurrences just add another element of intrigue to his work. Beneath Dover Castle, which sits upon the chalk hills of the English port, is a maze of tunnels which were dug in the 18th century for troops stationed there. The English Heritage, which manages the site, is regularly called upon to perform sweeps of this labyrinth, searching for mysterious figures that tourists have reported seeing. Doors are heard slamming, things move as if by magic and occasionally men in wartime fatigues appear. The castle was among a number of sites visited by eight top authors this year after the organisation decided to invite them to visit their spookiest sites for inspiration. And the result is a book of ghost stories from writers including Jeanette Winterson, Mark Haddon and Sarah Perry – with proceeds going towards the conservation of English Heritage sites across the country. The castles and stately homes of England have long inspired ghostly myths and legends. After all, location is vital to a good ghost story, and these sorts of old buildings provide a tried and tested backdrop in a genre that has deep roots in English architecture. Here at Nicholas Jacob Architects we have worked on a number of conservation and renovation projects in buildings with stories attached to them. 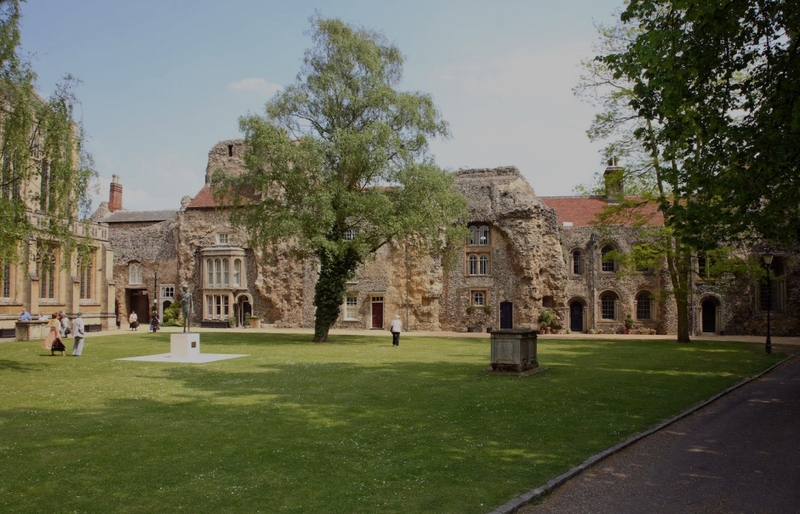 These include Gippeswyk Hall, where a ghostly white lady has been seen by several witnesses in the upper part of the hall and a strange mist has been seen emerging from the chimney when no fires were burning within and the Abbey ruins in Bury St Edmunds which is a hotbed for ghost sightings and stories. Needless to say, I never saw a ghost at any of these projects – nor did any of my team. But like many others, I enjoy the mystery and magic of the tales. I also think they add to the importance of maintaining and preserving such buildings – and their stories – for generations to come. According to English Heritage, there have been many unusual occurrences in their properties which have prompted investigations by staff. One of these was at Castle Rising, a 12th century keep in Norfolk, which was once the exile place of Queen Isabella, widow of Edward II. Here paranormal investigators were called in by staff to conduct tests following sightings by visitors, many of whom claimed to have seen figures dressed in monks’ clothes. Others said they had been pushed or nudged while looking around. Similar accounts of visitors complaining about being barged into have been made at Portland Castle, in Dorset, and Scarborough Castle, in Yorkshire. At Portchester Castle, in Portsmouth Harbour, a member of staff heard the sound of horses’ hooves and then saw a riderless horse emerge from the walls of the castle, race across the area within the walls, and then disappear again. At a medieval merchants’ house run by English Heritage in Southampton, staff raked over the gravel on the cellar floor before leaving work one evening and locking up. The following morning they found footprints that were clearly visible in the gravel, starting in the middle of the room and going into a wall. One footprint was partly in the wall. He is absolutely right. Ghost stories are part and parcel of British history. And intrinsically linked to that history are the buildings where those hauntings take place. That’s why we take tremendous pride in the conservation work we do to protect those buildings. We hope to work on many more projects involving historical sites in future – and we will keep you posted if we ever come across anything unusually spooky.